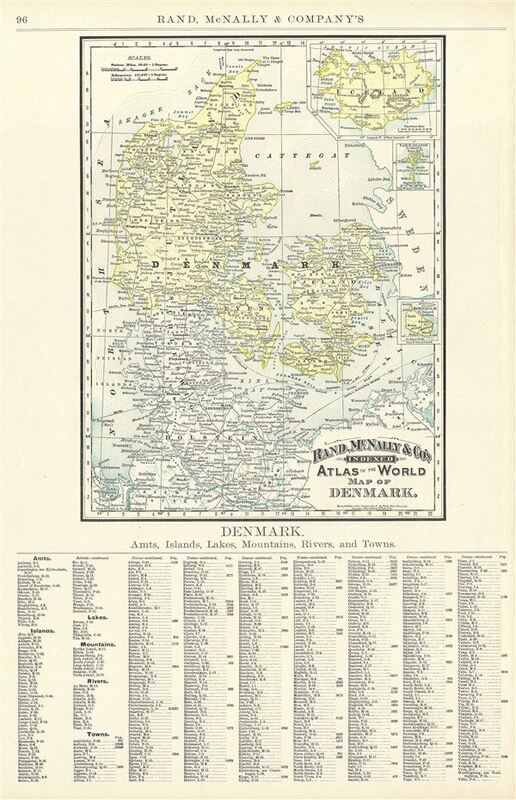 This is a beautiful example of Rand McNally and Company's 1892 map of Denmark. It covers all of Denmark including the Duchy of Holstein. The Cattegat is also identified. Three inset maps detailing Iceland, the Isle Bornholm and the Faeroe Islands are included. As this map was being printed Scandinavia was in the midst of a prolonged period of peace and prosperity that led to a cultural and population boom. This map of Denmark, printed on half the page unlike most other maps in the atlas, contains a list of amts, islands, lakes, mountains, rivers and towns in the lower half of the page, below the printed map. The northern part of Denmark is color coded. The map notes several towns, cities, rivers and various other topographical details with relief shown by hachure. This map was issued as plate no. 96 in the 1895 issue of Rand McNally and Company's Indexed Atlas of the World - possibly the finest atlas Rand McNally ever issued. Rumsey 3565.024 (1897 edition). Philip (atlases) 1026 (1898 edition).